In my post cookbook breakup period, I’ve been looking for new inspiration. So in addition to trolling the blogs for new recipe ideas, I’ve casually started buying cooking magazines again. I figure if I can spend $29.99 on a cookbook that I only grab a few recipes from and then neglect on the bookshelf, why not spend $2.99 on a magazine that I can tear the pages from and then recycle? The math might not add up but the space reclaimed on my bookshelf is priceless. BAH Note: You’ll want to be sure to pick through the crab meat for any small bits of shell or cartilage. Even in the dead of winter, I was able to find crab at the grocery store. I think I used Phillip’s lump and it didn’t cost me an arm and a leg. Heat olive oil in a dutch oven set over medium high heat. Add onion and fennel and cook until softened. Add tomatoes and vegetable broth and bring to a boil. Reduce heat and simmer the soup for 10 to 15 minutes. Working in batches, carefully transfer the soup to a blender and process until smooth. Return the soup to the pot, taste for seasoning, and add salt and pepper as desired. Add crab to the soup and simmer for 5 minutes to warm through. Serve immediately. Hmm, I like the concept but not the fennel so much. I wonder what would make a good substitute? 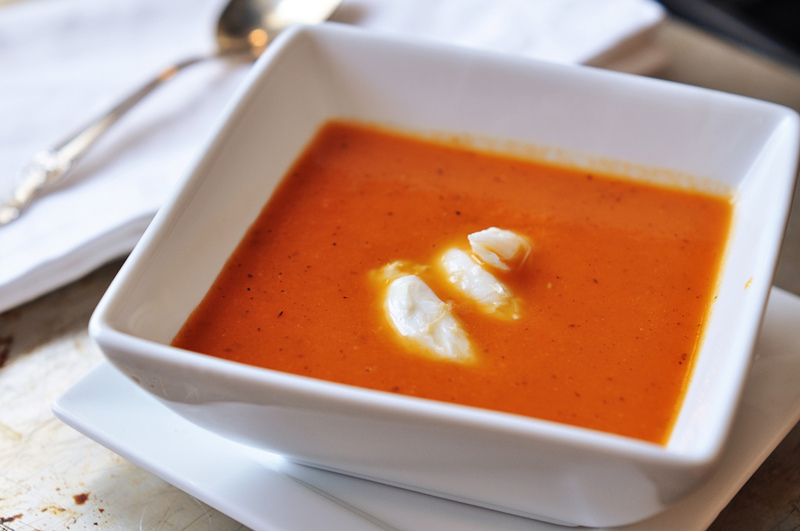 Love the idea of crab in a tomato soup though. Love the idea of crab in just about anything, actually. Jennifer, I was leery of the fennel as well. But I used it and it was lovely…just gave it a little more depth of flavor. And yes, crab in just about anything is a good thing. Fennel + crab sounds delicious. In the year I’ve been getting Bon Appetit, I don’t think I’ve made a single recipe. So that subscription is falling by the wayside. Beth, this would be a fabulous beach weekend soup. It’s super quick and easy and you can make a ton of it quite easily. The amount of crab you put in is up to you. If you use it more as a garnish then it’s still quite budget friendly as well. i love all the components of this dish: fennel, tomato and crab. and the fact that it’s not cream of any of those components makes this dish a Win. and if you served this in the dead of SUMMER at room or slightly cooler temp would be nice too… a year round soup! WIN. Lan, this would be fantastic served lightly chilled on a hot summer day. Dare I say it would be perfect? OMG! Lan’s comment reminded me why this looked so familiar! 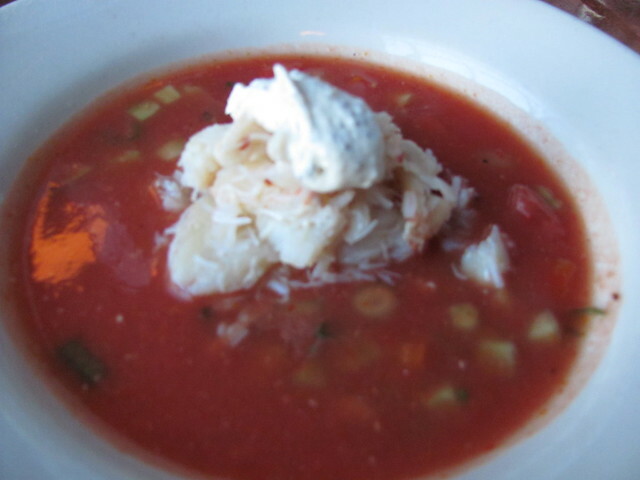 I had gazpacho with crab meat as part of my birthday dinner last year. Fan-freaking-tastic. Ah Jennifer, then you are familiar with the happiness that is tomato and crab. And you will take a chance on this? This sounds so yummy. I want it… with a pimento cheese BLT. Funny you should say pimento cheese Brooke. We were out at dinner last night and talking about it. I’ve never had it, but maybe I’ll give it a try down in Georgia this summer. That soup shot is beautiful. And that combination sounds so intriguing! Thanks Elizabeth. You should give it a try. It’s lovely. The fennel does sound lovely, though the cheapest crab I can find at my grocery store was $15.99 per pound last time I checked (ouch!). After watching a season about crab fishing in the Northern seas on “The Deadliest Catch” I can definitely understand why, though. Jenna, we are fans of Deadliest Catch at my house as well. Was very sad about Phil. After watching what goes on to get the crab to market, it takes a special person to get on one of those boats. You don’t need a full pound of crab, although you could go crazy and use that much. I found 8 ounce containers of Phillip’s pasteurized lump and it was under $10 (I think). That looks delicious! I never know what to do with crab meat and this is perfect! Jessica, I hope you’ll give this soup a try. And, if like Brooke suggested, you serve it with a pimento cheese BLT, maybe it can bring a bit of the south to you out in the wild west. How’s the new house? Wendi – your logic works for me! I just bought and used fennel for the first time. I made an orange and fennel salad and I demanded to know why I’ve never used it before. I love it. I’m bookmarking this recipe. Erin, I’m still on the fence about fennel. I don’t think I would enjoy it raw but I absolutely embrace it in the soup. I hope you do give this a try and let me know what you think. I never would have thought of putting tomatoes, fennel, and crab together. Sounds delicious and easy though. I subscribe to Cooking Light and Saveur, but am not very good about throwing the magazines away. They just pile up. I really should tear out the good recipes. Jen, back in my Cooking Light days, I was terrible about letting the pile grow. I think I had two or three year’s worth of magazines that I finally had to go through and rip pages out of. Took me forever but I’m glad I did it. And I’m glad I pulled this tomato, fennel, and crab soup out of Bon Appetit….I expect it will be making a return appearance at my house. I think I enjoy freeing up bookshelf space more than I do closet space. I fully support your decision to go back to ‘zines. I’m partial to Bon Appetit for obvious, blogfriend reasons. Ali, I’m actually thinking of breaking up with another cookbook that I haven’t opened in ages. I’m still torn but I have a feeling it will end up in the “donate” pile.